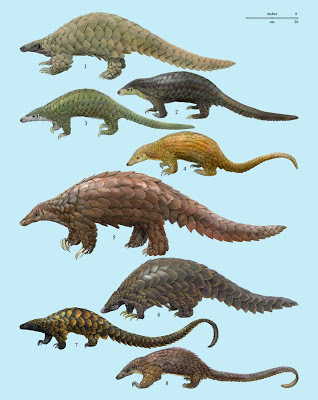 Pangolins, or the scaly anteater, are a strange branch on the phylogenetic tree of mammals. A single order, Pholidota, with one extant family, Manidae, with one single genus, Manis, comprised of the eight remaining species at left. They are the only mammals with hard keratin scales, and this undoubtedly is part of the reason they are both popular for hunting as well as endangered. Pangolin skin makes for interesting and unusual leather products, similar to armadillo, while the odd scales considered to have (unsubstantiated) medicinal properties for asthma and lactation. As pangolin scales are little different from toenails, it seems unlikely that humans would derive much more benefit from their consumption that we would by becoming nailbiters. Pangolin has been a bushmeat favorite for many years. On a habitat level, when they aren’t rolling themselves into impressively armoured balls, pangolins are important for controlling insect populations. It’s been illegal to trade pangolin products since 2002, and yet, when I did a quick search today for pangolin products, it turns out they are being openly offered on the Internet. Whether the dealers offering pangolin meat and scales for sale can actually deliver the goods is something I don’t intend to explore. It’s an oddity of human nature that the more endangered and rare a product, be it pangolin products or platinum, the more hotly we imbue that product with delicate and rare qualities. So when a Chinese “fishing” ship carrying approximately 2000 frozen pangolins destined for illegal trade ran aground on reefs in Tubbataha Reefs Natural Park, a UNESCO World Heritage site in the Philippines, the main source of surprise wasn’t the illegal cargo. After all, the Chinese market has to be sourcing its pangolin habit somewhere, so it makes sense the traders were flying under a Chinese flag. The real surprise, for me, is the irony of traders who deal illegally in endangered and protected animals traders being undone by an endangered and protected reef.